from event on 27 June 2013. Tweets collected with Martin Hawksey’s TAGS v.5, searching for hashtag #OLHtalk. Edited to remove retweets, obvious duplicates, and non-event-related tweets; see also complete spreadsheet. (note, this does not necessarily collect every tweet sent with the hashtag, just those found by the Twitter Search API). Apologies, this page is slow to load because of Twitter’s complex styles/scripts on embedded tweets. The Web was created for scientific communication, but 20 years after its launch, only a small percentage of scientific/scholarly publications are freely Web-accessible/reusable. Only about 12% of publications are self-archived compared to an estimated 81% that could be. Open Access publishing is growing but it covers only some articles, and comparatively little older, humanities, or book/other content. Repositories, run by parties other than publishers, containing possibly preprint or alternate forms of content, may offer much of the low-hanging fruit in expanding access to research literature. A late-breaking related development is the CHORUS proposal (ClearingHouse for the Open Research of the United States) from a group of mostly-US scientific publishers and publishing organizations. This proposes a publisher-run system, hosting content on publishers’ sites, to fulfill the new US government mandate of public access to new federally-funded research results, as expressed in the White House Office of Science and Technology Policy (OSTP) policy memorandum. I’ll just say that upon initial inspection I see this as an effort by incumbent players to control and contain the emerging open-access environment, and as much narrower in scope than the type of global, open system I would envision and advocate. I’d also note Ross Mounce’s recent, excellent guide to researcher self-archiving. 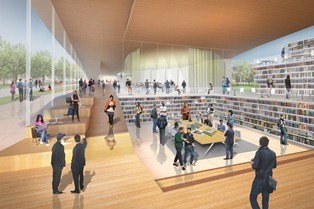 “Easy steps towards open scholarship” (LSE Impact of Social Sciences blog, May 24). Expanding on and contrasting to both CHORUS and Mounce’s guide, here I present six ideas to broaden, accelerate, and amplify the impact & uptake of repositories, from a global perspective of researchers and users, academic and not, and all types of work in all fields and all countries. What might we do to globally make the biggest difference the soonest with the least resources? “OpenRef“: analogous to CrossRef, a single service point to look up, request, or submit materials, offering the simplest, most user-centered possible interface for all needs. “Best available version” concept: recognize preprints, drafts, outlines, alternate articles, book summaries, etc., as legitimate versions for many purposes. Identifier assignment and association/clustering (e.g. of DOIs) for all materials. 80/20 approach: discover and focus on the content that is most needed. Crowdsource the identification, prioritization, discovery/archiving, and creation of archivable works, e.g. with the #paywall hashtag. Global scope: not limited by institution, discipline, country, educational level, or genre of work. Also, in section 7. Current and possible players I discuss how various organizations/projects partly already do, or might in future, take these approaches: e.g. Google Scholar, arXiv, and JISC. In section 8. Frequent objections, I discuss questions like, doesn’t Google Scholar do this already? and, don’t most fields lack the necessary preprint culture? Finally in 9. Lean Startup Approach I ask how we might usefully think of this project like a “lean” or agile startup. try to bring together advocates [around some issue] who don’t necessarily agree, and collaborate for optimally engaged, evidenced, clarified expressions of their respective positions. 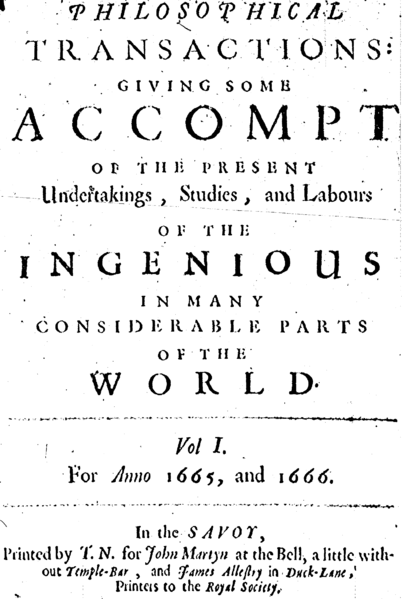 The immediate prompt was the, complex, often contentious debate over “open access”, i.e. free public accessibility and reusability of scholarly work. In particular, the tensions between open-science advocates and conventional academic publishers, and between advocates coming from science vs. from humanities. This has some potential advantages not only for audiences, but for advocates themselves, who often have to continually restate nearly the same arguments in many forums, with comparatively little time to fine-tune or correct their statements. This way, they can get arguments as right as possible in one place, and reference it from other contexts. To me, the debates over Open Access are an intriguing case study: a highly complex and contested issue (“wicked problem”) that cuts across and involves all areas of science and scholarship, as well as political and commercial sectors. How do people from scientific and scholarly backgrounds engage in this — do their practices and habits of communication serve, or hinder, or need to be adapted? Also, questions of managing argumentation link together a number of current key problems: how might/should peer review evolve? ; how to design commenting systems for the scholarly and general Web? how to catalyze innovative collaboration and counteract homophily? Clearly (or arguably? ), these questions are part of fundamental issues about how truth or wisdom and accord may be found, reconciling inquiry and dialog and civility. There are many possible contexts to consider this within: e.g. philosophical inquiry/logic from Socratic dialogue on; the history of scholarly/scientific communication; current explorations of commenting and annotation systems for the Web; or the current, Semantic Web-related, computational analysis of argument structures & data. Though all the winds of doctrine were let loose to play upon the earth, so Truth be in the field…Let her and Falsehood grapple; who ever knew Truth put to the worse, in a free and open encounter? 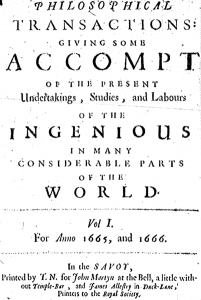 title page of 1st issue of the Philosophical Transactions, 1665. But how well does that really work? Could it be, to some extent, an artifact of early-modern European print culture that’s been reified as a indisputable model? Do digital-era practices/tools address its limitations, or might they point to alternate models? how much more might be learned if we think of theory not as static structures to be demolished or assertions to be falsified, but a set of understandings to be questioned and shaped. In this spirit, we could replace the traditional battle and sports imagery with a metaphor from cooking. Daly (1996: xv)’s ‘‘theories should be treated like bread dough that rises with a synergetic mix of ingredients only to be pounded down with the addition of new ingredients and human energy’’. We might also consider this issue from a quantitative or attention economy point of view. 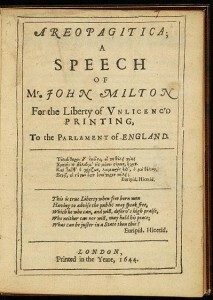 In the time of Milton, or the early Philosophical Transactions, it may have seemed the printing press had let loose an anarchy of expression. However, the set of people who might print a newspaper or pamphlet, or pen a significant article, was still quite small, and a gentleman might, within a few-mile stroll of then-tiny central London’s key coffeehouses and salons, and perusal of their periodicals, survey many fields of discussion. 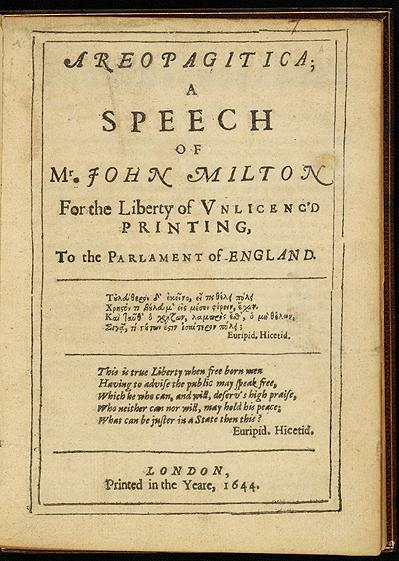 I wonder, is Milton’s space of doctrinal contention a print-era artifact: implicitly conceiving a “field” that’s bounded by the finitude of print and pre-modern attentional economy, but increasingly insufficient for our comparatively unbounded informational world? Now, we do have various mechanisms to re-bound the anarchy of expression: for example, topic pages, Wikipedia, bibliographies, reference works, summary reports, literature reviews, citation analysis (who cited this), etc. Editors and producers of magazines, journals, or news shows may play the role of surveying topical fields and bringing disparate views into engagement, ideally. How might we do better? When we are constantly encountering these independent voices in contentious “free and open encounter,” how well can we actually relate and evaluate them? Of course, the goal of most “voices” — news sources, media products, people — is to get more of your time, attention, and/or money, not to enlighten you. But let’s say you want to be more enlightened, or you work in one of the fringe areas like education or research where in some sense this is the goal? Perhaps a key goal for publication/communication design should be better structures to map and relate arguments, not just present them. an approach to scientific debate [that] requires both parties to agree on empirical tests for resolving a dispute and to conduct these tests with the help of an arbiter. You might say this approach rejoins or re-bounds the infinite space of discord, by building adjudication into the process of work/expression, rather than letting it remain, as typical, an external and subsequent process. It follows from Kahneman & Tversky’s systematic studies of how any single mind, or voice, no matter how ennobled or intelligent or authoritative, is widely prey to common cognitive biases. The heroically individual Author, it turns out, is often astray; truth is woven in discourse. How might we design forums/argumentation to make credibility follow from easily-accessible and verified evidence of deep, good-will engagement with counter-argument and diverse views? Mellers, Hertwig and Kahneman . “Do Frequency Representations Eliminate Conjunction Effects? An Exercise in Adversarial Collaboration?” Psychological Science. July 2001 vol. 12 no. 4 269-275. doi:10.1111/1467-9280.00350. [2[ Tannen, Deborah  “Agonism in academic discourse.” Journal of Pragmatics, 2002. doi:10.1016/S0378-2166(02)00079-6; PDF.